We were invited to review The Little Kitchen Bistro near Winchester during a recent trip to Hampshire. It’s a bit of a hidden treasure and set up by an award-winning company with great credentials when it comes to families – both in making them feel welcome and in looking after their own employees. The Little Kitchen Bistro is run by parents for parents and families. Staff, including the senior management team are parents who may have struggled to find work elsewhere once having children. It’s a set up that obviously works as the company has won three business awards in the past year. When I say The Little Kitchen Bistro is a hidden treasure, I’m not exaggerating. Without having being invited for lunch I doubt we’d have ever known it existed, even though its just 10 minutes from Winchester City Centre. It’s tucked away at the end of a private road to the north of the city. Even the postcode lands you somewhere on the nearby A34 rather than at the Bistro itself. Top tip: don’t follow your Sat Nav once you get to the A34. Follow signs for Headbourne Worthy and Winchester Golf Academy or search for the location using Google Maps. A good visual clue is the nets that catch the balls on the driving range. The Bistro is located in an open plan building shared with the reception and shop for Winchester Golf Academy. It clearly gets a lot of its custom from golfers looking to fill up on good coffee, cake and more substantial meals before and after a round. As we were staying with Tin Box Grandma and Grandpa for a few days we asked them to come along with us. When we arrived there was a table waiting for us complete with a high chair for Tin Box Baby. We ordered some drinks and began browsing the lunch menu. There was a wide selection of meals from light bites to larger dishes with prices ranging from £7 for sandwiches to £10 for main meals. There was also six options for kids priced from £2.50 for soup to £5.50 for a pizza. We placed our food order and 20 minutes later were presented with some freshly cooked and delicious dishes. Tin Box Tot and Baby shared a ham pizza and tomato pasta, while Tin Box Grandma had the spinach and coconut soup with a chunk of bread and Tin Box Grandpa had the Thai Green Curry with naan, I enjoyed Thai Salmon fishcakes, fries and salad. We really couldn’t fault the food or friendliness of the staff. Our only criticism would be that we waited quite a while for our plates to be cleared, by which time the girls were getting very fidgety so we didn’t have the opportunity to sample the mouth-watering cakes. They looked amazing! Some colouring pencils or children’s books might have helped at this point. 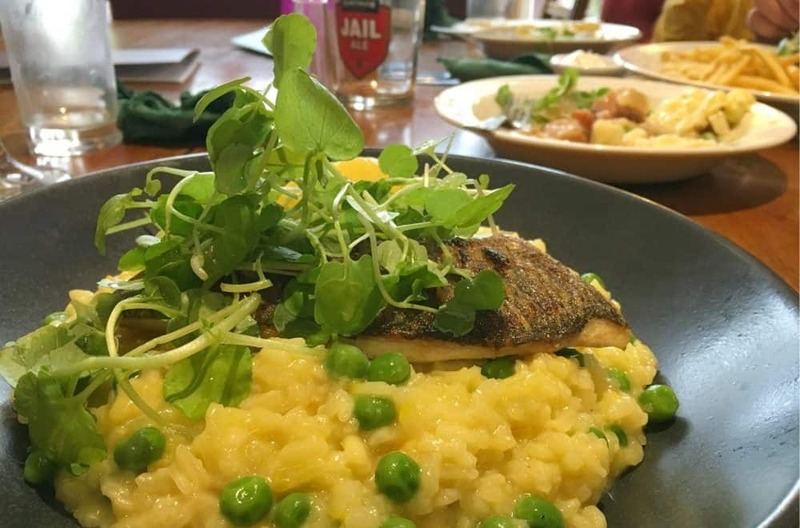 If you’re in the Winchester area and are looking for somewhere that serves up tasty, home cooked food for the whole family then you can’t go wrong with a visit to The Little Kitchen Bistro. You might also be interested to know they do outside catering for events like dinner parties and weddings, and some awesome sounding picnics for special occasions. Disclosure: we were treated to lunch at The Little Kitchen Bistro in exchange for an honest review. All opinions are my own and those of my family.